Leasing Available from $33.06 per month! High-performance, high-volume, 11x17 black-and-white printer with versatile paper-handling options, such as stapler/stacker, 8-bin mailbox, and multifunction finisher. 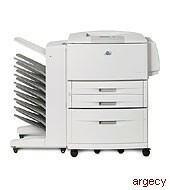 Get HP reliability with this cost-effective printer for your department needs. Leasing Available from $31.90 per month! Leasing Available from $38.44 per month! Leasing Available from $25.99 per month! Leasing Available from $24.92 per month! Leasing Available from $51.25 per month! - Take advantage of advanced finishing options. - Automatically produce professional two-sided documents. - Manage your business more efficiently with integrated solutions. - Save valuable time and cut costs. - Enjoy effortless network management. - Get fast, professional printing and a quick first page out. - Receive automatic supplies alerts. - Print office documents with ease. - Enable simple and secure printing. Footnote for duty cycle: Duty cycle is defined as the maximum number of pages per month of imaged output. This value provides a comparison of product robustness in relation to other HP LaserJet or HP Color LaserJet devices, and enables appropriate deployment of printers and MFPs to satisfy the demands of connected individuals or groups. Footnote for recommended monthly print volume: HP recommends that the number of printed pages per month be within the stated range for optimum device performance, based on factors including supplies replacement intervals and device life over an extended warranty period. Power consumption footnote: Values subject to change, see http://www.hp.com/support for current information. Power reported is the highest values measured using all standard voltages. Purchase of optional (not included, sold separately) finishing accessories requires purchase of optional (not included, sold separately) 2000-sheet input tray. Two-sided printing unit is included on the HP LaserJet 9040dn; it is optional (not included, sold separately) on the HP LaserJet 9040 and 9040n. Additional input capacity requires the purchase of optional (not included, sold separately) 2,000-sheet input tray. Included on the HP LaserJet 9040n and 9040dn; optional (not included, sold separately) on the HP LaserJet 9040. Hard disk is optional (not included, sold separately).